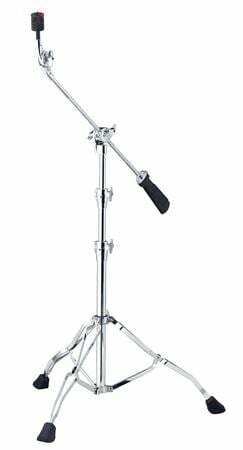 Shop Tama HC84BW Roadpro Boom Straight Cymbal Stand from AMS with 0% Interest Payment Plans and Free Shipping. On the HC84BW stand, Tama's patented toothless Quick-Set Tilter marks another Tama advancement in hardware. Relying on basic principles of physics, the Quick-Set Tilter holds its position using the friction of six smooth metal disc plates instead of traditional toothed gears, so you can adjust it to any desired angle. This mechanism also has a more durable structure than a conventional gear tilter. By simply gripping and pressing the two buttons on the both sides, users can attach and remove the Cymbal Mate with just one touch, making cymbals setup/breakdown a snap. Like Tama’s standard Cymbal Mate: fine adjustments to the cymbal's swinging motion can be made by rotating the unit. By inserting nylon washers into the leg stand joints Tama has improved durability and made the leg action much smoother! Tama’s new Glide-Tite Grip Joint allows for a more secure attachment by using a metal-to-metal contact point. This provides an extremely solid anchor and complete isolation for a tom or cymbal. Because the stand does not move with the instrument, the natural resonance of that instrument is maximized. just as nice as it looks! Very good addition to my set. The Best Cymbal Stand there is! Professional stand, materials, workmanship, fit & finish. The counter weight will balance even the largest cymbals. This stand should outlast them all, I have Pearl, DW, Mapex & Ludwig and if I was cleaver (never been accused of that) this stand should have been the ONLY type purchased. Convertible from boom to straight & because of the heavy weight construction the legs don't have to be spread far apart (space saver). Yes it is expensive but not the most expensive, it is certainly the BEST. If you have been around long enough then you should remember Tama's Titan stands and hardware. Though not as heavy in weight and whole new revolution of deployed setups, this stand is top notch, flexible and the counter weight is the only way to go if you are a heavy hitter. The conversion into a straight stand and back to boom is killer stuff. It's not a mystery on why all other companies employ their own knock off so called hardware from a basic Tama idea and usually don't even come close in dignity, but are remarkable in looks and features. This is the best you can buy unless you can find some classic Titan hardware. You get exactly what you pay for out of this stand and more. Don't mess around with other companies and go cheaper. Budget is budget, but so is paying for a stand that's going to stand up for years and at your pinnacle, your paramount moments behind the kit. The stand will be there, will you be there, too?